I find myself drawn to the details in life. Noticing the small parts of the natural world, like insects, mushrooms, moss, and lichen. As a result I feel like I experience tiny pleasures that the world often does not slow down long enough to notice, let alone enjoy. As Summer starts to reveal herself here in Wisconsin, I have been on the prowl for signs of her arrival. However, many signs of the season are not nearly as easy to sneak up on as mushrooms. Take for example, butterflies. When was the last time you stalked a butterfly? Not caught, but stalked. When I think of chasing butterflies, my mind is filled with images of innocence; curly-haired children frolicking through sun soaked pastoral scenes, the long handles of their butterfly nets extending from their freckled arms towards the blue sky. Constantly fluttering, yet seemingly unafraid butterflies surround sunburnt cherub faces, the settle calmly poised fingertips. This was not my experience. Butterflies are incredibly difficult to sneak up on. I know what you are thinking, “No they’re not! Butterflies sit around suckin’ nectar out of flowers all day. How can you not sneak up on that?” Well, I tried. Hard. I tried every approach. I snuck slowly. I stood still. I tiptoed. I army crawled. I even ran wildly through the grass hoping that maybe they would mistake me for some sort of huge mother butterfly, or gigantic mobile flower, and flock to me. But they didn’t. Then, one landed on my shoe. But I was still determined to capture an image of the beautiful Swallowtails that I had been chasing all day. 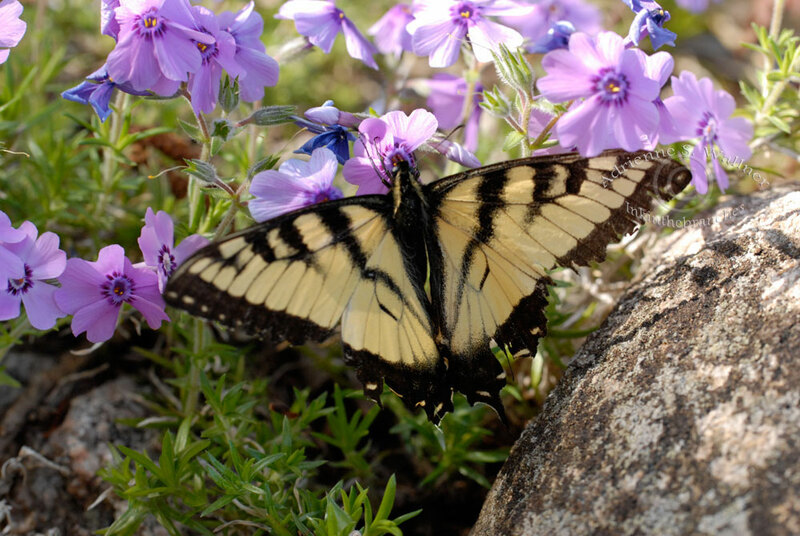 It wasn’t until I sat down near a patch of tiny purple flowers and watched a yellow swallowtail flutter between blossoms for about 30 minutes in hopes that he would “get used to me” that I could approach without startling. Moths are a completely different story. 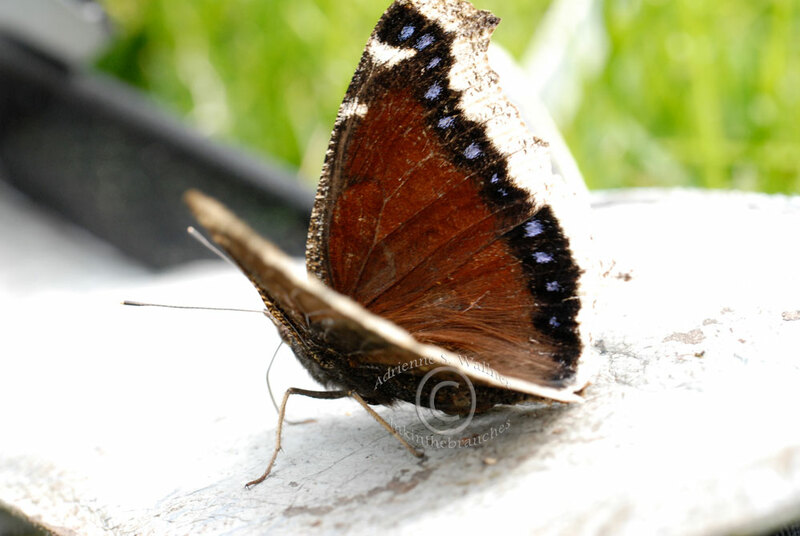 Especially when they have just emerged from their cocoon, are drying their wings, and are barely moving. I can stalk the heck out of some stationary moths. 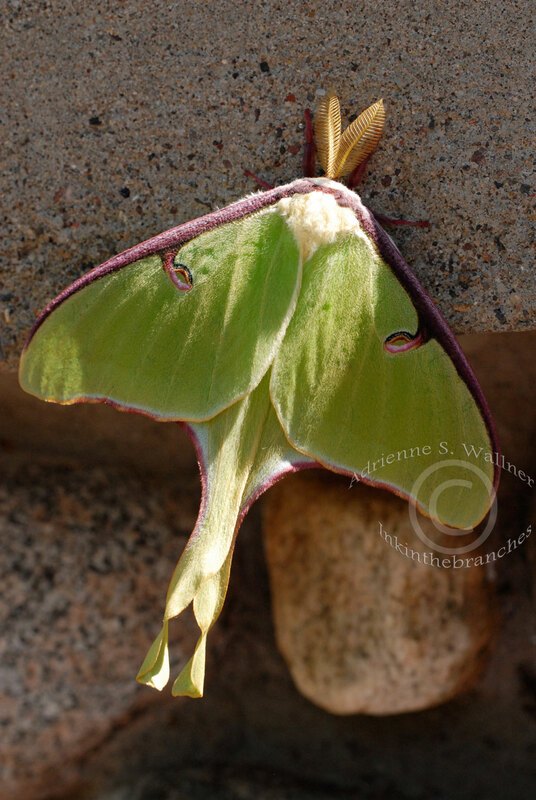 This fantastic specimen is a Luna Moth. I could not stop taking photos of this awesome creature. After doing a bit of research in my Audubon guide, I found out some interesting facts about these guys. 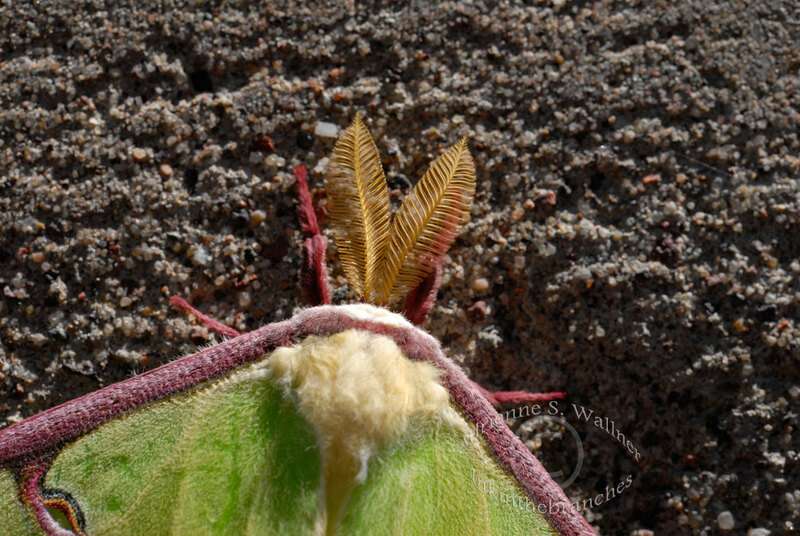 Luna moths only live for about a day and their sole purpose is to mate. 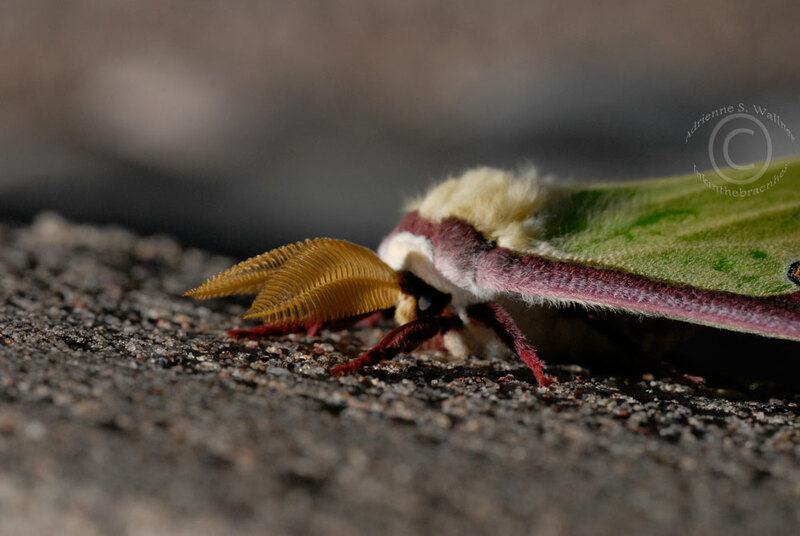 Luna moths don’t eat (or even have mouths). They emerge from their cocoons, wait for their wings to dry, and start lookin’ for love. 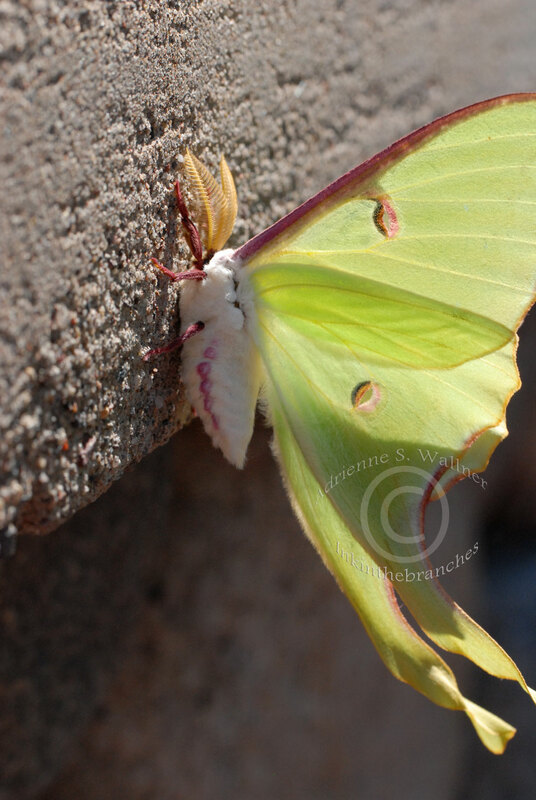 This Luna Moth is a male; you can tell by how large and fluffy his sweet antenna are. In addition to chasing winged creatures around all day, I was also on the look out for any remnants of the Morel mushroom season. I have a particular love for mushrooms and have photographed MANY over the years. However, the Morel is a very illusive mushroom and can be difficult to find. Plus, Morels are know for their unique flavor and are often picked and eaten, so they don’t stick around long. Their growing season is also very brief. As my time in the Northwoods of Wisconsin was drawing to a close, I had consigned to the fact that I wan’t going to shoot a Morel this year…until I looked right beside the cabin. Lovin the Luna! Beautiful pictures sis! And you CAN eat the Morel no matter what Andrew says.